It's time to start taking marijuana stocks seriously. That's because they're about to offer incredible profit potential thanks to the rapid growth of the legal pot industry. According to ArcView Market Research, U.S. companies that sell legal marijuana will rake in $6.7 billion in sales by the end of 2016. That's a 25% increase from $5.36 billion last year. But the industry's growth won't be the only thing that makes pot stocks a great investment in 2016. In fact, the marijuana market's intersection with this other high-growth market will drive the profitability of these marijuana companies for years to come. The first reason is the widespread legalization of cannabis across the United States. You see, the number of states allowing the use of medical marijuana has been steadily increasing over the last 16 years. Only California, Maine, and Oregon had legalized it before 2000. Now, there are 24 states – and Washington, D.C. – that allow legal marijuana use of some kind. That number is expected to increase this November as activists from more than 20 states submit ballots for a vote on cannabis legalization. 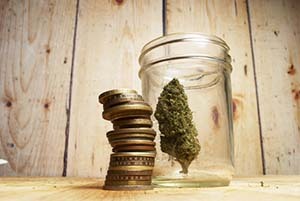 The second reason why marijuana stocks have seen such immense growth is because pot's increasing popularity is influential across a range of sectors. One market sector that will benefit from marijuana's widespread acceptance is biotech. Back in March, U.S. News & World Report said biotech and pharmaceutical companies are starting to ramp up medical research on marijuana as federal laws gradually ease. Cannabis is even having an impact on social media as companies create platforms as a way to unite the cannabis community. One of the biggest companies is MassRoots Inc. (OTCMKTS: MSRT), a social media site where users can share marijuana-related stories and experiences. According to CNN Money, MassRoots has more than 725,000 users. Another sector pot's increased use impacts is healthcare. Marijuana research site Leafly reports cannabis can provide relief for arthritis, which affects 20% of all U.S. adults. Companies are looking into creating marijuana oils and ointments for treating joint pain brought on by the ailment. But this next sector is about to have a massive impact on marijuana stocks in the next few years. That's because this $187 billion industry will make the entire marijuana consumer experience much more efficient. This industry we're talking about is Big Data, which could have a huge impact on revenue for marijuana retailers. Big Data is broadly defined as companies that use analytics technology to collect data for businesses. Many companies hire Big Data firms like International Business Machines Corp. (NYSE: IBM) and Oracle Corp. (NYSE: ORCL) to determine consumer trends, which allow companies to market their products better to increase sales. In other words, Big Data collects information about a company's customers to help that company make more money. And the Big Data industry is seeing explosive growth right now. According to market intelligence firm IDC, the valuation of the Big Data analytics market is projected to hit $187 billion by 2019. That's up 50% from the market's $125 billion valuation last year. Big Data companies have the necessary tools to fuel the marijuana industry's growth even further. Their analytics services can track plant cultivation and purchasing trends, which would help pot retailers adjust their inventories to meet consumer demand. One data firm specifically for cannabis retailers is Flowhub. The company employs marijuana-tracking software that helps businesses grow plants in compliance with state laws. MarketWatch reported roughly 100 retailers across Oregon and Colorado use Flowhub's services. More analytics firms are catching on to the pot industry's potential, including the app Headset launched in February that helps collect transaction data. It's clear these two industries are starting to work together to fuel each other's growth over the long term. Money Morning will be providing constant coverage of the cannabis industry. Later this summer, we'll also be providing a list of the best marijuana stocks to buy, so stay tuned.